A lovely trip to the top of the chairlifts at 650 m on the northern slopes of Aonach Mor. The top station affords affording fabulous views of hills and lochs of Lochaber, as well as a taste for the high life. This is a lovely trip for anyone interested in taking a short walk in montainous surroundings and/or exploring montane flora and fauna, as well as those who wish to just contemplate the beauty and diversity of wild Lochaber. Well worth a visit. The Nevis Range Centre in Lochaber supports a Mountain Gondola service and the Pine marten Café at the Base Station. There is also a High Wire Adventure Ropes Course. 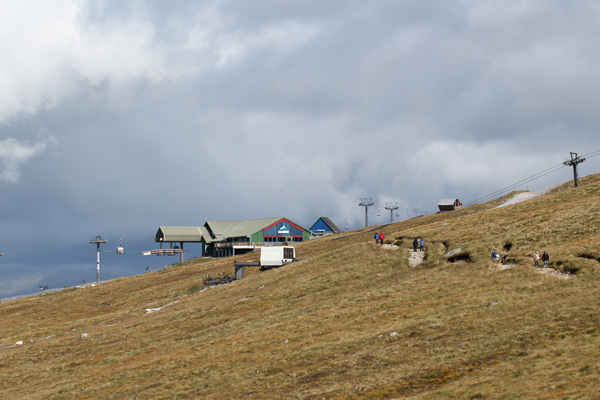 At the Gondola Top Station at 650m, there is a two person chair lift for skiers, the Snowgoose Restaurant and Bar, a gift shop, toilets, interpretation board, children play area, a Snow Sports School and a Mountain Discovery Centre. The Mountain Discovery Centre is a small interpretation centre with exhibits on the construction of the Nevis Range Gondola, the local environment (including information on the flora and fauna), renewable energy and the weather. There some short walking trail starting from the Gondola Base Station. ( e.g. the River Lundy Walk) in Lochaber. 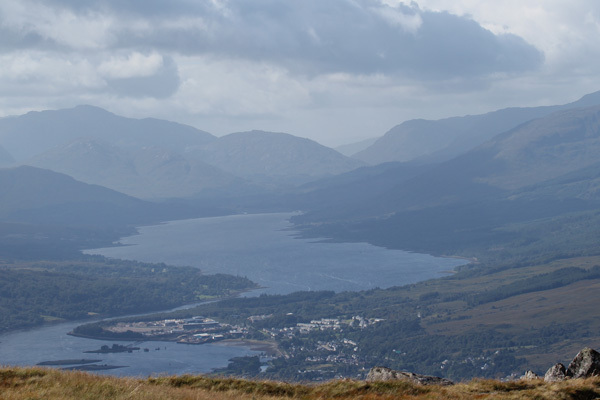 There are also two short mountain walks at the Gondola Top Station: the Sgurr Finnisg-aig viewpoint walk to the north, and the Meall Beag viewpoint walk to the southwest. 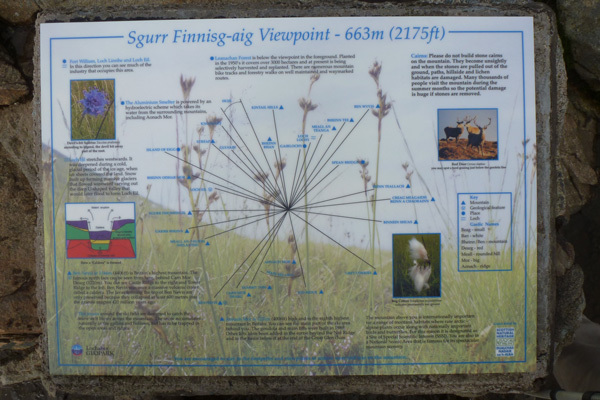 From the Gondola Top Station: The Sgurr Finnisg-aig is a short pleasant walk along a gravelled path with good views of the upland grassland, heath and blanket bog assemblages; a real treat for the botanist. At the viewpoint, there are some benches and an interpretation board (identifying the landscape features) . The walk passes by the start of the Great Glen two person chairlift, used for winter sports. The return walk takes about 40 minutes. 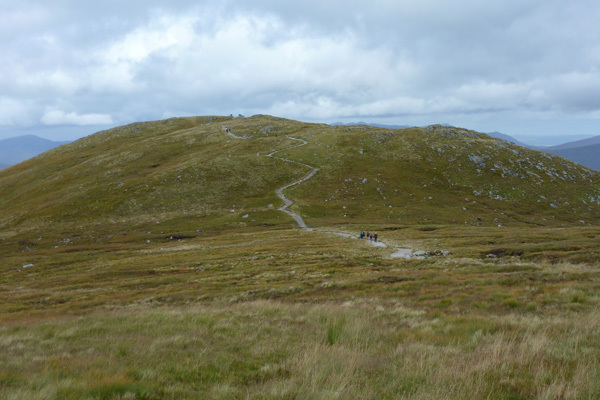 From the Gondola Top Station: The footpath to Meall Beag viewpoint is signposted from the restaurant. It passes by a children play area and the wooden gondola (the pod) constructed in 2011 and marking the start of the World Championship Mountain bike Downhill Trail. 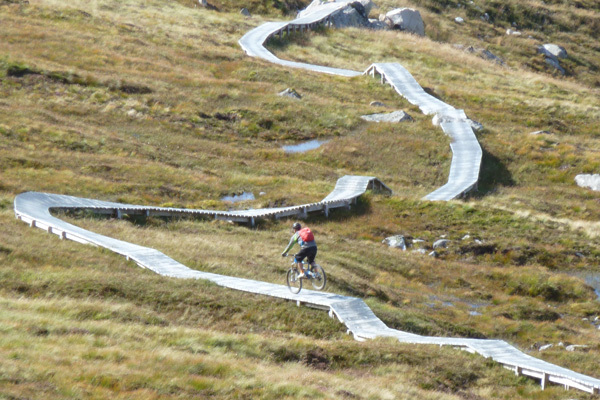 The gravel path passes by the Quad Chair used by skiers, and the mountain bike red route. The track passes through upland grassland and heath and affords fabulous views on route of the surrounding peaks with their boulder strewn slopes and rocky outcrops. 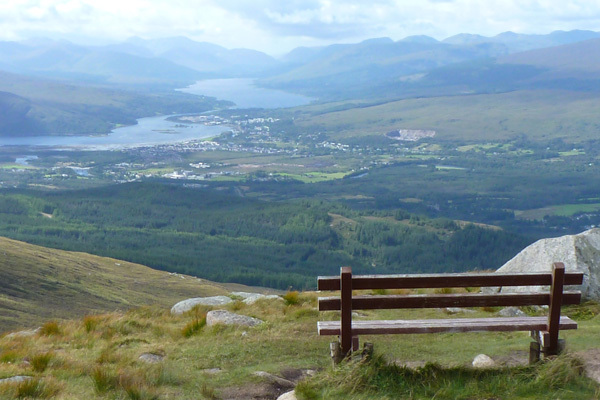 There is a bench at the viewpoint to admire the panoramic views over Loch Eil and across the Great Glen. The return walk takes about 60 minutes. 1. By foot or mountain bike using the specified trails. 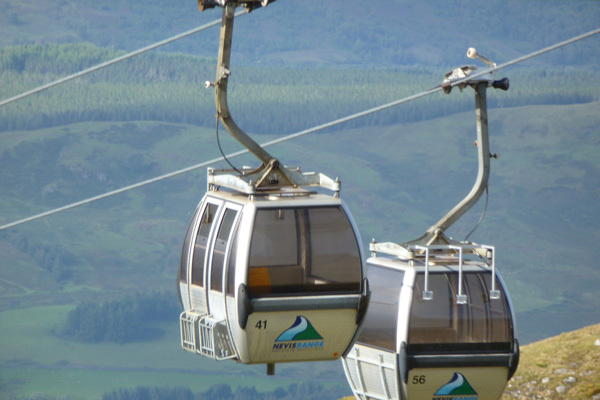 Aonach Mor can best be accessed by the Mountain Gondola that ascends to a height of 650m. The Base Station and Ticket Office are situated in at Leanachan forest. The trip takes approximately ten minutes and affords some stunning views on route. The cabins are fairly stable but can wobble on occasion, the extent according to weather conditions. 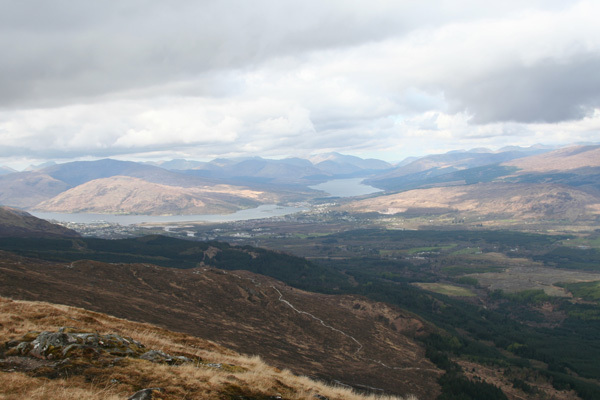 Aonach Mor, near Fort William, in Lochaber is the eighth largest mountain in Scotland at 1221m high. It is part of volcanic complex of Ben Nevis, which includes Aonach Beag and Càrn Mòr Dearg, the latter linked to Ben Nevis by an impressive arête. Much of Aonach Mor and Ben Nevis Range in Lochaber has been designated as an SSSI based on its biological and geological significance. The mountain provides a diversity of habitats including montane cliffs, semi-permanent snow bed, montane moss heath, upland heath and upland grassland, supporting a diverse flora and fauna. The Ben Nevis Range also has one of the most extensive developments of boreal grasslands, acid alpine and arctic calcareous alpines in the UK, the latter supported by the high altitude limestone slopes of Aonach Beag. Aonach Mor is composed mainly of granite with some sedimentary and metamorphic rock formations. The granite bedrock consists of the silica rich Ben Nevis Complex Outer Granite (Porphritic Granodiorite) and the silica poor Ben Nevis Complex -Quartz-Diorite, both intrusions deposited in the Silurian Period. Near the base, the flora of Aonach Mor is a combination of Atlantic oak and mixed woodland (with alder, birch, rowan, willow and Scots pine), and coniferous plantation (Leanachan Forest). Higher up, the flora merges into upland (wet) heath (Calluna and Erica species with deer grass, (Scirpus cespitosus) and purple moor-grass (Molinia caerulea)), and Empetrum-Vaccinium (Crowberry-Bilberry) heath with bearberry (Arctostaphylus uva-urni). Calluna-Eriophorum (heather and cotton grass) blanket mire assemblages are found on the deeper peat with black bog rush (Schoenus nigricans), Pinguicula spp and Drosera spp according to local conditions (geology and edaphic factors). The upland grassland consists variously of matgrass (Nardus stricta), Tufted Hair-grass (Descampsia cespitosa), Wavy hair grass (D. flexuosa), sheep's fescue (Festuca ovina) and Viviparous sheep's-fescue (F. vivipara), interspersed with stiff sedge (Carex bigelowii); the species composition being dependent on geology. On higher ground the vegetation merges into more extensive areas of Nardus stricta – Carex bigelowii grass heath, Carex–Racomitrium moss-heath and Carex bigelowii – Polytrichum alpinum sedge-heath according to altitude and local conditions, the latter two assemblages associated with corries and hollows with prolonged snow cover. Three-leaved rush (Juncus trifidus), spiked woodrush (Luzula spicata), the national rarity curved wood-rush (Luzula arcuata) and mossy cyphel (Minuartia sedoides) occur on rocky ledges and on bare exposed ground. 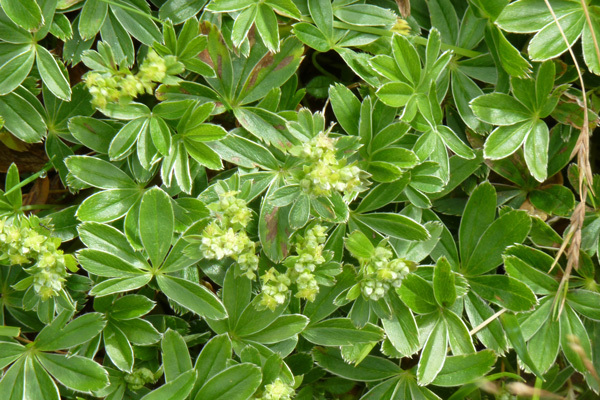 Other specialities include Alpine Lady’s Mantle (Alchemilla alpine), dwarf willow (Salix herbaceae), mountain avens (Dryas octopetala ), moss campion (Silene acaulis), Sibbaldia (Sibbaldia procumbens ), alpine speedwell (Veronica alpine), starwort mouse-ear (Cerastium cerastoides) and species of alpine saxifrage associated with base rich conditions (e.g yellow mountain saxifrage (Saxifraga aizoides). The screes also support a rich fern flora, including Alpine Lady-fern (Athyrium distentifolium) and fern parsley fern (Cryptogramma crispa). The endemic fern, Newman's lady-fern (Athyrium flexile), was recorded on Aonach Mor in 1950s, although its current status is unknown. The bryophyte flora is particularly diverse and include the mosses, woolly moss (Racomitrium langinosum), hoary fringe moss (Racomitrium canescens), dusky fork-moss (Dicranum fuscescens) and Alpine haircap (Polytrichum alpinum), and the liverwort, snow rustwort (Marsupella brevissima). 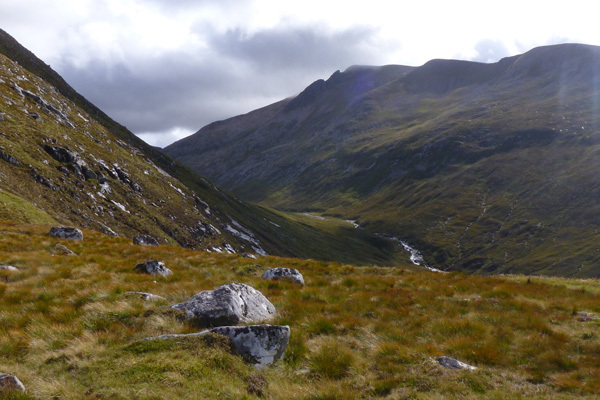 A detail survey of the vegetation of the Ben Nevis SSSI and Special Area of Conservation (SAC) can be found in information link. The fauna of Aonach Mor ranges from species associated with the woodland and rivers on the lower slopes (for example, pine marten and dipper) to fauna associated with open moorland (such as red deer, wheatear, ringed ouzel, meadow pipit, stonechat, grouse, golden plover, buzzard and hen harrier) to more montane fauna (including mountain hare, ptarmigan, dotterel, snow bunting and golden eagle). A great day out from Moidart, Ardnamuchan or Mallaig.